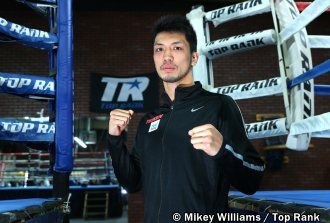 LAS VEGAS (Oct. 17, 2018) – Ryota Murata, one of Japan's most revered sporting heroes, is ready to make his debut as a Las Vegas headliner. Murata (14-1, 11 KOs), a 2012 Olympic gold medalist, will defend his WBA middleweight title against Rob "Bravo" Brant (23-1, 16 KOs), Saturday at MGM's Park Theater. In the co-feature, Maxim "Mad Max" Dadashev (11-0, 10 KOs) will defend the NABF super lightweight belt in a 10-rounder versus former world champion Antonio DeMarco (33-6-1, 24 KOs). The entire undercard will stream live on ESPN+ beginning at 7 p.m. ET and includes the return of Michael "Mick" Conlan (8-0, 5 KOs), the Irish sensation who will face Nicola Cipolletta (14-6-2, 4 KOs) in an eight-round featherweight bout. Also on the card is Conlan's 2016 Olympic nemesis Vladimir Nikitin (1-0), who will take on Clay Burns (5-4-2, 4 KOs) in a six-rounder at featherweight. It was Nikitin who won a controversial decision over Conlan in the 2016 Olympic quarterfinals. Murata and Brant worked out Wednesday at the Top Rank Gym in front of a large contingent of Japanese and American media, This is what they had to say. "I am honored to be here in Las Vegas. I want to show everyone a great fight. Brant is a great fighter, and beating him would mean a lot for my career." "I want everyone to watch on ESPN+ to see a great fight. I'm going to take what I learned in the gym and show it in the ring." "I am happy to be a headliner, but there is more to come. I think there are bigger and better fights for me. This is just a start." "I would like to fight Canelo Alvarez, but without the Mexican beef!" "It would be nice if it happens. It would be especially nice because it would be good for boxing." "Yes, I think it would be a war. I think it would be a real exciting fight." "I have worked so hard for this opportunity. It's a dream come true to fight for a world title, and it's in the Mecca of Boxing, Las Vegas. It doesn't get better than that." "I have the utmost respect for Murata as a fighter, but this is my time to shine." "This is definitely the best I've ever felt. I've been in Las Vegas for eight weeks preparing for this fight. Murata is a champion and an Olympic gold medalist, so I know I will have to be at my best." "We are prepared for everything because we know anything can happen when you fight a great champion like Murata. It will be a good battle, and I am going in there with bad intentions." ESPN+ is the premium multi-sport, direct-to-consumer subscription streaming service from The Walt Disney Company’s Direct-to-Consumer & International (DTCI) segment in conjunction with ESPN. ESPN+ offers fans two exclusives, original boxing programs The Boxing Beat with Dan Rafael (Tuesdays, weekly) and In This Corner (twice monthly). In addition to exclusive Top Rank boxing content, programming on ESPN+ includes hundreds of MLB, NHL and MLS games, thousands of college sports events (including football, basketball and multiple other sports from more than 15 conferences), UFC (beginning in 2019), Grand Slam tennis, international and domestic rugby, cricket, new and exclusive documentary films and series, acclaimed studio shows and the full library of ESPN’s award-winning 30 for 30 films. Fans subscribe to ESPN+ for just $4.99 a month (or $49.99 per year) and cancel at any time.